Experience the beach spirit at this terrific North Myrtle Beach resort. Bay Watch Resort is a large oceanfront vacation destination in the Crescent Beach section of North Myrtle Beach, South Carolina. It is on the beachfront and just blocks from Highway 17 so it is really easy to find. There are three towers at Bay Watch Resort and each has its own oceanfront pool deck. Guests staying in a North Myrtle Beach condominium in one tower are invited to enjoy the water amenities at all three high rise towers of this North Myrtle Beach resort. Bay Watch Resort I is the northernmost tower and most of the condominiums in this North Myrtle Beach are oceanfront. Bay Watch Resort I has condominium of different sizes so there is one that will work beautifully for your family. Choose a cozy one-bedroom unit for your romantic rendezvous and a two- or three-bedroom North Myrtle Beach vacation rental when you are bringing the whole family to North Myrtle Beach, SC for a great vacation. Each of these North Myrtle Beach rentals has a well equipped kitchen so you can make yourself at home while you are away from home. Most of the kitchens in this North Myrtle Beach resort feature a dishwasher and most of these North Myrtle Beach condo rentals have a washing machine and clothes dryer. The oceanfront pool deck at Bay Watch Resort I features a sparkling blue swimming pool and a couple hot tubs. 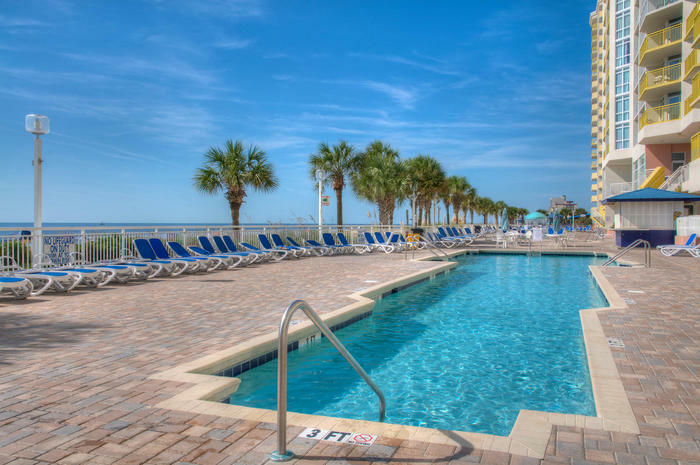 You can easily race to the edge of the Atlantic Ocean from your poolside lounge chair at this North Myrtle Beach resort. From the balcony of your oceanfront or ocean view North Myrtle Beach rental at Bay Watch Resort I you can see the Atlantic and hear the crashing waves. This North Myrtle Beach resort has a lazy river, indoor swimming pools, kiddie pool, fitness center, restaurant, sports bar, convenience store and covered parking. This oceanfront North Myrtle Beach resort is smoke-free. Crescent Beach is a beautiful stretch of beachfront in North Myrtle Beach, SC that is most welcoming to families. Fishing piers, water sports, live entertainment theatres, shopping, dining and championship Myrtle Beach golf courses are nearby this renowned North Myrtle Beach resort. Elliott Beach Rentals is not affiliated with onsite management or the HOA of Baywatch 1.